Wei born and grown up in Changsha, an ancient city famous for its embroidery and spicy chilies in China. In his childhood, his mother is a traditional Chinese Xiang embroidery craftswomen and stimulated his interest in textile design. After studying 4 years in Textile Design and Engineering at Donghua University, Shanghai. He has been touched by the fashion of this city. 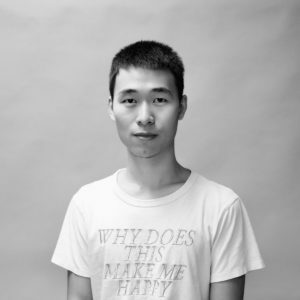 At the last academic year, He was invited by Seazon textile to prepare a show for 2016 Shanghai Fashion Week as an assistant designer. He loves Music and keep writing songs with his favorite guitar. He believes in music and design will be an integral part of his life. Now Wei is a graduate student in NCSU, trying to accumulate strength for becoming a good Fashion designer, and will graduate in the Summer of 2018 with a master’s degree in Textile and Apparel, Technology and Management. Inspiration came from those dangerous creatures like centipede, fire ant and poisonous plants. This design collection would be a young men’s line including whole garment knitting, machine embroidery and digital printing design by using nature fabric like silk, cotton twill and denim. This collection is trying to present the attractive and dangerous side of men with casual to close-fitting silhouette.